Omar Rudberg is back on top, but last time he was at the top of our Chart Toppers, it was with his previous release Que Pasa. Both of his songs are incredibly catchy, but La Mesa has seriously been on repeat for the last two weeks! This is a new track on our Chart Toppers, and a relatively new release in general. The song features the vocals from Benjamin Ingrosso, so already it’s a hit with me! This is a bit different from Benjamin’s own style but his vocals work well with this upbeat song. This is a case of ‘better late than never’ as finally I’ve caught on to this masterpiece from Molly. This is Swedish pop at its best, and fronted by an incredible vocalist, it’s hard to go wrong. The next step is to finally listen to her latest EP, so watch this space! Capo Plaza has been at the top of our Chart Toppers no less than 6 times since the song was released a few months back, but the time has come to make way for some new favourites! Although moving down a few spots, I’m still loving this song, hence a spot in the Top 5! I can’t tell if it’s the vocals or the music of this song that is just so addictive, but whatever it is, I’m finding it hard to stop listening to the song. I’m not usually into DJ style songs such as this one, but there’s something about the melody that leaves me wanting more. From memory, Perdonami has been in each and every Chart Toppers since I began this series at the start of the year, so after a while, it’s understandable to run out of ways to compliment this song. This song has been a constant throughout 2018, and it’s definitely one of my all-time favourites. The former FO&O boys are absolutely killing the music game, and this song is absolute proof of that. The Swedes just know how to do pop music, but this is a step up from the FO&O songs in that it’s a bit more grown up, and a bit more contemporary. All of the other Benjamin Ingrosso songs have been instant hits with me, but this track took a few extra listens to get into but I’ve happily hopped on the train. This song is a bit more relaxed than his previous releases, and more pop oriented than dance oriented, but he does both styles very well. Latino pop is having a moment not only in our Chart Toppers but in the music scene in general, and this song fits in perfectly. It definitely has the Latino flair with a catchy melody and a good balance between the vocalists of the song. Keeping with the Latino pop theme, we have the debut solo release from Omar Rudberg which mixes Swedish pop with some elements of Latino pop. There’s not much else to say about this song other than it’s a banger. It won’t be long until we get to hear new music from Italian rap star Gue Pequeno, but while we wait, this song is still getting a fair bit of air time. Once again, it has a bit of a Latino flair which is hinted at with the title of the song. By now this song has to be labelled my favourite from this year’s Eurovision, as it is the only one that I keep listening to, even months after the competition ended. I think that can be credited to the fact that it’s not just a ‘Eurovision’ song but is super radio friendly and super catchy! Donny Montell has impressed us over the years with his new releases, but this is by far one of his best. It still features his pop style but has a bit more of an edge, and I’m here for it. This electropop tune is probably the best I’ve heard in this genre. From the second it starts, you’re hooked in for the entire 4 minutes. From the beat to the melody and the vocals, everything in this song just gels together perfectly. Just when you think you can’t go on, Robin releases such a catchy pop number. He is tired of being just friends, but we’re not tired of listening to his music. If you’re in the market for a new pop song performed by an incredible vocalist, this is definitely it! Aminata is back with another cracking song! The song is both contemporary but also nostalgic with the retro beat. Once again, Aminata’s vocals shine, especially during the choruses and the bridge which are my personal highlights! 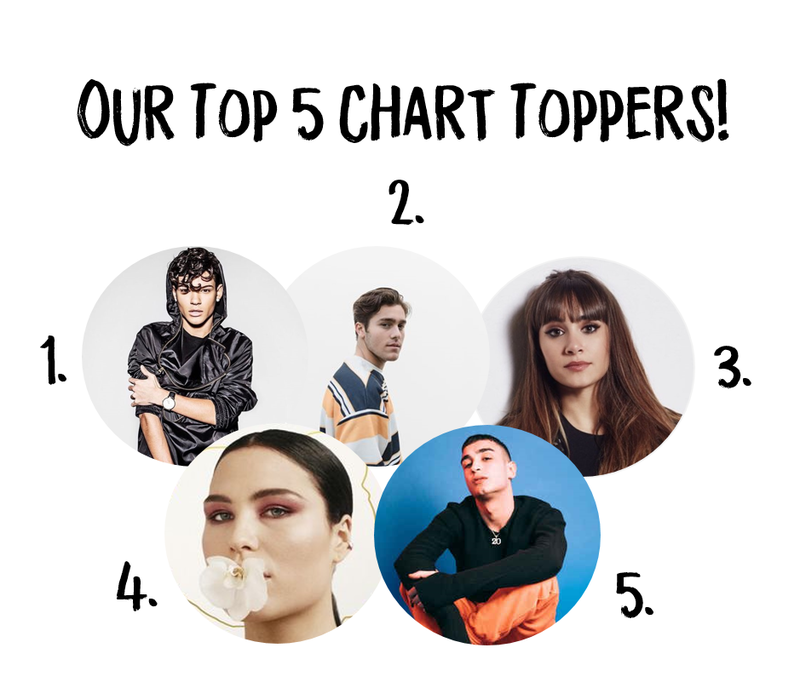 We’ve got a full set of former FO&O members on our Chart Toppers once again with Felix Sandman also getting some air time with his latest song Imprint. This song just made me want more from Felix, and I’m hoping an album will follow sometime soon. Back with a grown up sound is Alessio Bernabei, another former boyband member. He’s put the traditional pop banger style aside for this track Messi e Ronaldo which although still pop, has some of that Dear Jack rock sound. This is a good track, and I’m looking forward to hearing his upcoming EP. It’s not much of a secret that I enjoy this song, or in fact any song that Nathan Trent releases. There’s something incredibly infectious about his voice and his energy, and that’s why it’s still in our Chart Toppers! Czech Republic puts a call out for Eurovision 2019 entries!